Say hello to archive show #68, featuring Eddie Adamis, Eddie Kochack, Eddie Mekjian, and so many more whose names are not Eddie! Shimmy on! It's archive show 66 coming your way, with Esin Engin, Hillel and Aviva, and Eddie Kochak sings about a gal named Sahara Sue... If this don't make you shimmy, your shimmier needs a recharge! Presenting archive show #64, with Michael Hartophilis, John Bilezikjian, and George Abdo live! Yalla! Awww, yeah - here comes archive show #61, probably my favorite show so far! Yes, Radio Bastet meets Mr. Smooth - and they really hit it off! In case you didn't know, Mr. Smooth is my husband Byron. On The Mr. Smooth Show, he presents the best of the space age bachelor pad music of the 1950's and 60's. There are many points at which exotica and Middle East intersect, and on this joint program he and I explore some of those crossroads. It was a blast to do (unfortunately we lost our final voice-over closing track! ), and we plan on doing at least one more show together! In the meantime, raise a glass of your favorite potent potable and shimmy 'round the bachelor pad! Radio Bastet hits the big 6-0 with Eddie Kochak, Youssef Kassab and a bit of Middle Eastern exotica from the one and only Martin Denny! Grab that cocktail shaker and shake it! 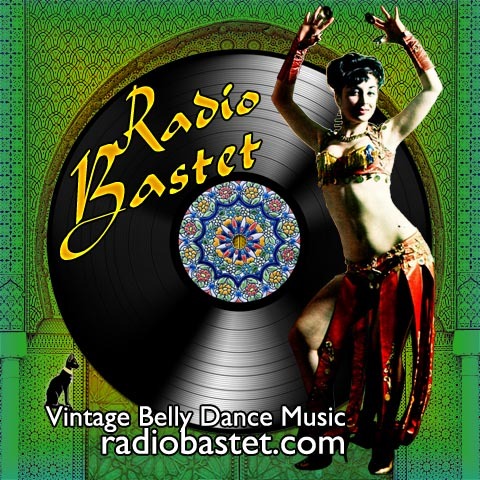 Look out, it's archive show #56, with some groove-tastic bellyrock from John Berberian and the first appearance of Farid Al Atrash on Radio Bastet (about time!)! Raq out with your riq out! 4. KEMANI GARIB ET. AL. Presenting archive show #54, featuring the Feenjon Group, John Vartan, Bert Balladine, and Karizma returns to teach us all the right moves!